Here are some great resources that can supplement your Bookmaking as Authentic Assessment IP – Book Arts and the Bookmaking Handout. Also the IP – Bookarts 2011.ppt and the in-class Assignment for Documentation Project #2 BookArts. ENJOY! arts, books & creativity ~ a project from the National Women’s Museum in Washington, DC. Great resources, videos, ideas and inspiration. Textured papers – a simple reference for making interesting papers for bookmaking. All you need is some computer paper, a watercolor strip, a few crayons, and some tools (brushes, toothbrush, sponges) to make beautiful papers. I experimented with creating textured papers. Besides painting with a paintbrush, I tried using a toothbrush to splatter paint and and a sponge to create a more textured look. I took pictures but I am not sure how to load them on here. 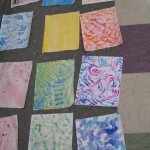 I have previously experimented with textured paper making in my creativity class. Here I made a book using the textured paper as my illustrations. 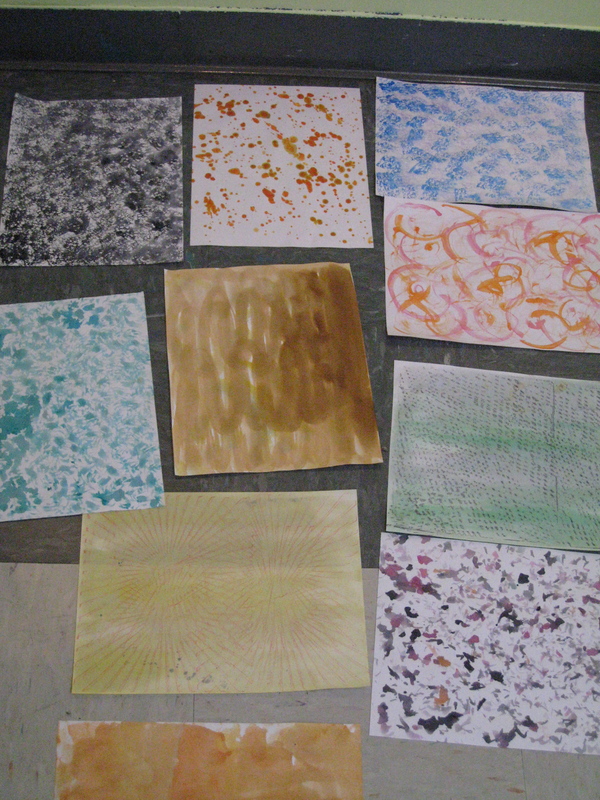 We used a variety of methods and materials to make these textured paintings including my favorite, soap mixture with paint and water to get a bubble effect on the paper. So today I decided to do something new and I watched all the videos on how to make the different books. I made the diamond fold book and the pop-up book myself. I can see how these are easy to use in a classroom. I realized an important factor to making these books is using a folding stick to create a crisp clean fold for the books. I thought the website was really cool. I like how it incorporates both art and language arts. I was surprised to see how elaborate some of the books were. I feel that this would be a fun series of lessons that students of any age would look forward to. I agree Jeremy…This was a three year project in the school. Did you read the executive summary on the research and how students writing and art making skills increased? What books did you make? I used the spatter technique, sponging, crayon resist, and lots of different watercolor techniques. I also had some fabric paint that I spread around on the paper with the sponge, which turned out very interesting. My favorite technique was the spatter and the sponging. Are we allowed to create patterns and use different colors on one piece of paper? Because I mixed different colors on most papers, and now I’m wondering if that was wrong. Wrong? Depends on your purpose, your personal artistic goals. If you are creating a “page” to use for bookmaking then they door is wide open. If you are creating a set of papers for a classroom or if you will be using a set of papers for collage work, you may want to develop a more systematic set to work from. But wrong…..never! This sound like they will surely meet your needs. So what books will you make today? I did not have the materials I would need to make some of the more complex books (like the circle book, and the urchin book), but I did try to make an accordian book. I also tried to make a journal. I didn’t attempt to make books in the shape of animals, but I liked the book in the shape of a fish. I also made textured paper by flicking paint at the paper…It was a fun but messy process (I had to put lots of newpaper down and work in my garage)! I enjoyed bookarts, but I do have questions about the IP bookarts assignment. Are we going to discuss all of this more in class? Also, can we use any type of paper to make the textured paper (computer paper, construction paper)? Yes, we will explore the BookArts project more in class. Did you look at the power point? We also will be making more books — I have a great handout for you! On Monday I was in the classroom, I helped a student make a book while waiting for other students to finish an assignment. Instead of just folding paper and stapling it together we cut the middle out of half the pages and cut about an inch down the top and bottom of the middle of the rest of the pages like we learned in our Reading Class recently. The students really enjoy having a book and being able to create it themselves. Today I tried the self portrait book but could not figure out the reverse fold and tuck. I am interested to figure out this method because it could be a great frame for a picture of a setting. The flag and tunnel methods also seemed like they would be good 3-d styles to use in a classroom also to portray different settings. I can make the pop up and acordian books and those are simple to use and show to students as well. The textured paper reminded me a of recent project I had seen done in a preschool. The young students were coloring a picture of a firetruck, but using toy cars so the tires would leave the paint marks. Would this count as a textured paper? It seemed like a great idea. I will bring a book that i created today with me to class since I cannot figure out how to post pictures. I also experimented this morning with making different types of texture paper. I liked doing this on a snow day because it really made me think about stuff that I could use around the house to help in this process. My favorite was the wet on wet, I wet both my paper and my brush and added the watercolors, as I watched it run across the page. Another favorite that I experimented with today was that I used the surface of my refrigerator to make a pattern on my paper. After the refrigerator created unique bumps on the paper, I used the splatter technique to add more color to the paper. It was interesting to see how the two colors/patterns accented one another. In addition, I also used the floor tiles as a surface to trace my paper and I used a small pretzel to make swirls on the page. I also have pictures, but I am not sure how to upload them. I forgot to mention in that doing this art project, it reminded me of the article that we read for class about the three orientations to arts. I kind of related this to article because although everyone was using the same basic supplies (watercolors, a brush and paper), it is obvious that no two designs looked the same. Although we were given directions on how to approach this project, everyone had an invidiual interpretation. Lauren — excellent synthesis! You really GOT the IDEA of the Expansive orientation. 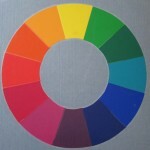 No two will look alike, but you all explored similar concepts of color and texture in different ways. As the teacher looking at each students collection I can see how you learn, take risks, move, and your style of working and thinking. A lot of learning from a some watercolors, sponge and brush wouldn’t you say? I would definatly say alot of learning is taken in by a project that seems simple, especially using such basic supplies! It makes me wonder what other supplies can be used (both simple and more complex) to help explore the endless possibilities in the world of art! I was amazed at all the different books that could be created! Living in a dorm, I don’t have many materials and supplies to be able to create these, but they seem like fun to make. I really hope to be able to experiment with them in class. Same goes for the texture paper. I never thought about how any different ways there are to paint. I’m really excited to be able to use this in my class, especially as another way to assess my students besides the traditional ways. But do students really learn more this way and if so why? Amanda — check out your syllabi and the supplies you need for this class! 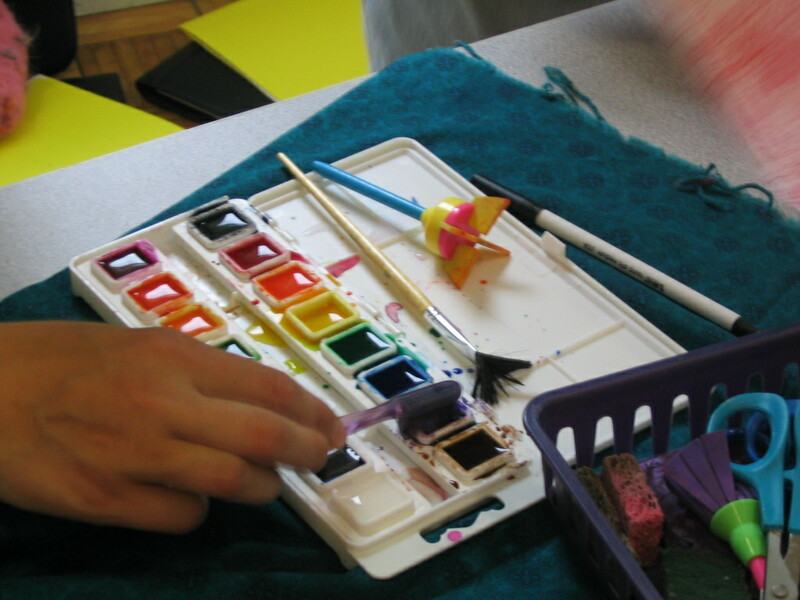 You need to begin your teacher toolbox….art on! This weekend I went back home to New Jersey. While home I experimented with the texture paper. Surprisingly I got really into it, and even started naming my art work when I finished! Out of the ones you suggested to try, and experimenting on my own, I really liked the spatter one. I love how the colors came together once they dried. I created two pieces of the spatter, each using different colors (one with warmer colors, the other with cooler colors). It was interesting seeing how I used the same technique for both, but both came out so differently. I can’t wait to continue to experiement using diferent supplies to create a work of art. Amanda — why are you sooooo surprised that you “got into it”? What keeps you from having fun? From being creative? I just finished making textured paper and I did not realize how messy it was going to be before I started. When I was finished, I had paint all over my mom’s kitchen walls, windows, tables, chairs, and floors (good thing she is at work)! The messiest technique (spattering) was also the most fun technique to use. I had a lot of fun with it as I felt like an artist. I made four papers for each technique and each one came out very different. On the top of the textured paper handout it said that we are supposed to put ours into a portfolio. Are we doing this on our own or in class? *I will post photos of my textured paper when we figure out how. I watched some of the videos on texture and the different ways that paper can be textured. The one method that I found interesting was the use of watercolor and salt. The paper ended up feeling granulated and the salt gave the paper a more dimensional look. Another technique I tried was the watercolor and the plastic wrap. When I put the plastic wrap over the paint, the plastic wrap collected some of the paint into the folds of the plastic. Overall, I had a lot of fun experimenting with watercolor and different texture techniques. I thought some of the ways to create the book itself were really creative and interesting. I tried the crayon resistant texture as well as the sponging texture. Both of them turned out very nice. I remember creating other textures when I was younger. One that I remember was with bubbles. I have heard of dipping the wand in paint, but the bubble soap creates some nice colors too. I have also heard of dipping a straw in paint and blowing through the other end. It creates a splatter look. I also made the pop up book! It was easy and quick but take the normal paper folder in half book to a whole new level! Using the pop up book and the textured paper would be a fun and creative way for the students to combine what they learned with art. I cannot wait to explore this more in our class at ESU and with the students in my placement! It was interesting to see all of the different approaches the students used when creating books. The word “book” is used pretty liberally, as the one was more of a scroll popping out of a soccer cleat than what I would perceive a book to be, but I suppose it serves the same function. I just went over everything on the ABC website, and found the directory of different book formats to be really helpful. I am not really thinking ahead to the book format yet, but I am going to go find some watercolors and ink and play with textures for a bit and make some interesting sheets. I was amazed to see the different books and projects that were created by kids and artists for the project from National Women’s Museum in Washington. I thought that it was so neat how art was integrated into the curriculum and the projects that the kids and artists created were spectacular and out of this world! It just goes to show you what amazing things your students can do when you give them the right opportunities. I will definitely be checking out the site more for more ideas and inspiration during this semester and beyond! I didn’t have the correct materials to try any of the book making out but I did experiment with the textured paper. It was a lot of fun trying to create the different kinds on the hand out and experimenting with ideas of my own. I look forward to working more with the textured papers and book making in class! I really enjoyed working with paints. I feel more comfortable with paints than any other type of media. I esp loved how there was so many different techniques I could use to create an individual look. I noticed how one student used thier refrig. for a texture so I did as well! I really liked how it looked. I used different directions with crayons (cross hatching) and colors. I also really like the splatter paint, because it was more abstract. I also explored with the soap idea and using a straw to blow through to spread the paint. (I dont recommend this because I got really light headed!!!) I def. liked the vareity of textures and materials that I explored with. The textured paper designs were Awesome! I started to run out water colors towards the end of them though. It was a lot of fun to splash the colors all over and get the table and chairs I was working around soaking wet and loaded with color. This was primarily in the spatter technique; however, I occasionally had some oops’ while working on other techniques. As for the books, man, they were tough to assemble, a couple real brainteasers in there. They were fun to create though and a lot of them would be great for students of all ages. Overall, the website was great, filled will lots of valuable information and ideas, and the activities were a blast. Today I created some really pretty water color paintings. I tried to do some of them the way that Alice Austin painted her pictures on her website. I also tried the splatter paint, really fun and really messy. I thought the water color book entitled “My Diary” was a great way to get the students to use their creativity to individualize each book. I made the simple part of the circles book, but I couldn’t figure out what the egg-shaped holder for the circle book was made out of. I also made the simple accordion book which is an easy and quick way to have young students create their own books. Wow, Dr. P! This website is very, very impressive. I’m glad that you showed us this. There are a lot of elements to this website that are very interesting. I looked at the bookarts that students have done and I thought that was very neat and impressive. I don’t think I ever did something like that in elementary school. That is just proof that students can excel in school with art and their creativity. Also, I tried the “Make your own book” and it was ver interesting and easy to do. It didn’t take me long at all (although I cut my index finger while doing it). I have pictures to show if you would like to see. This is very good, though, for students. Instead of students just writing on lined pieces of paper, students can get creative and create their own books just like some students have done on your website. That was very impressive and even left me wondering “How did they do that?”. Also, that e-mail that you sent out was very interesting with the google art project. You can use this website in so many ways. First, the pictures on the website are so clear and crisp. If students with visual disabilities have trouble seeing a picture they can zoom in and out as well. If you want to show detail in the picture, you can also zoom in and out. Also, you can use this website on a projector screen to show the whole class. This can lead to classroom discussions and also higher-order thinking. I’m really glad that you found this website because it will definently get put into good use for some, if not, all of us. Thanks, Dr. P! Glad to get the Integrated spin on the googleartproject. It is an amazing undertaking taking us all over the world to see some of the best of the best. I have already started my own collection! I really found a lot of enjoyment in giving some of these book making techniques a try. I found that attempting to make these books was a great alternative to shoveling my driveway! My creations were limited in how nice they came out due to the materials that I used. Notebook paper was my main ingredient in both the tunnel book and the pop up book page that I made and they both seemed to be as easy as the instructions made them appear. I did get a little confused with the paper folding techniques… I don’t think that any of these techniques have to do with each other, do they? I work as an activity director in a nearby resort and I will bring some of these book making ideas into my work, because they make excellent tools in the classroom as well as in an arts and crafts activity! I look forward to making these in class because I’m sure they will turn out as nice as our journals did! EXCELLENT…forget the driveway! make books…. Today, I had a lot of fun making different textured paper. I had done this previously in my Creativity Class and learned a lot of these strategies. I tried all of the recommended techniques, but I really enjoyed looking for additional ways to make texture. I had trouble finding textured surfaces in my home, so I tried to make some (crease in table, oatmeal in plastic wrap). This was a great way to spend yet another snow day. In addition, I found the books and examples made by both the adults and the children inspiring and creative. It was very interesting to see what they came up with and I look forward to trying some of the techniques. Students can use these techniques to make books of their own on just about any topic. These books can be used as a great form of alternative assessment and also just getting students excited about books, reading, and art. Students will be so excited to share their books, and they will be so proud that they made the entire book. I am very passionate about reading and writing and their importance in our everyday lives. My first day in my placement I asked a student to either choose a book to read or write in their journal, as my host teacher directed, and the student’s response was, “I don’t do that.” My immediate thought was: ‘I cannot wait to be in this classroom and make reading and writing awesome for this student somehow!’ Looking into this assignment, this might just be the perfect opportunity to make reading, writing and art relevant, fun and exciting for this student as well as all of the other students. The abc website offers so many great ideas for developing ideas and images. Not only to be used in book arts, but also to be used in any form of writing and visual representation. Also, the ideas are really useful because they can be specific to many individuals. I had so much fun creating textured paper, but I am looking forward to collecting more resources and experimenting with some of the methods new to me and trying a few of my own ideas. I am so excited to share this assignments with my students. Along with this being really fun for the students, I think that any student generated product is a much more meaningful assessment and it is important for students to have opportunities to be assessed on their own ideas, as well as expand and develop their ideas through these experiences. I can’t wait to see what the students will create. The only thing I am hesitant about is how much time goes into making a good book. Do you think our host teachers will be excited, or even willing to devote so much time to bookarts? I know their schedules in the classroom can be demanding, but I really hope they are! I agree with Lisa when it comes to how important reading is and how passionate I am about it. I could not imagine a day going by without me reading something for pleasure! I am also super passionate about art and I am so excited to make textured paper because it’s something I have never done before! I am really excite to use these in our class and I’m eager to see how they will turn out, just as eager as I was to make our journals! This website is extravagant, I definitely can not wait to use these techniques in my classroom. I really found the ABC website really helpful because it gave us a chance to see childen’s work and other ideas how we might formulate our books. I really like watching the videos on creating texture painting with the salt and saran wrap. I am actually going to try them tonight. Several children that posted their picture of their book were really creative and it shows how we can incorporate literacy into art. I think this project will give a better understanding on different ways we can intertwine art into science, social studies, and math. Thanks so much for showing us this site!! I experimented with creating textured papers and used splatter, wet on wet, sponging, and crayon resist techniques. I didn’t have a sponge to use for the sponging technique so instead I used a wash cloth and it came out really neat. One of my hobbies is scrapbooking, and now that I see how cool these textured papers come out I am happy that I won’t have to spend so much money at Michaels on pre-made background papers and… mine will be unique! I also made the books using some construction paper I found laying around my house. I’m not sure how to upload pictures so I will bring them with me to class. I can remember making a few of these in school when I was young. I look foward to using these in my placement classroom because they stood out in my mind, so I hope it will be something they will enjoy as well. I just finished exploring with the books and textured papers. I was only able to create the pop up book, but I did modify it a little bit to make it a little different. I used a lot of water colors and different textured surfaces to make my textured papers. I really enjoyed the textured paper because there was no real format to follow. I’m not very artistic and enjoy just being able to create something that may not be uniform like some others. I look forward to incorporating these books and textured papers into my classroom. Eric – the description of what you did dismisses what you say….”I am not very artistic”. I feel that allowing the students to create booklets in a classroom is a great way to motivate the children. If you were going to have the students take notes in your classroom, it would be too routine to have them just copy them down. If you said to the students ” Today we are goin to create a note taking booklet. You are to design them how you please!” The students would be much more excited and motivated to participate. Wow, this website and the ABC site are awesome! I really enjoyed the videos of how to make books and use the different techniques because I am a visual learner. If we had to do this without you teaching us Dr. Pinciotti or watching a video, mine would have been a mess. I also used the refridgerator as a texture as well as the carpet and one of my son’s diapers. I really enjoyed watching the students talk on the videos and what they get out of a Book Artist coming into their classroom. I look forward to integrating this into my classroom lessons!! I agree Ashley…there are some amazing websites and videos for arts learning out there. The snow and ice gave us the opportunity to utilize them well. I had a lot of fun experimenting with the water colors. 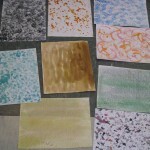 I did each texture paper that was listed and enjoyed the spatter one the best! I was able to spatter the water colors with the paint brush by using my finger and it turned out great! I think not really like the sponge texture paper because it was annoying when i did not have enough water color paint on the sponge and it took the longest to make; but it did turn out cool! I look forward to using this with my third graders because I think they will have fun making their own texture paper and they can use different objects to make designs. Im excited to see how I can integrate this project into the science curriculum the students are working on in my class. They are currently studying finger printing and my mentor teacher has already mentioned something about textured rubbings. I think that this would be a great lesson to integrate the book art project. The ideas are flowing! Colton….did you check out Chuck Close’s fingerprinted portraits? Google Chuck Close fingerprints….see you tomorrow. I was excited to use the different texture paper and I am curious how I am able to use them in class this semester. 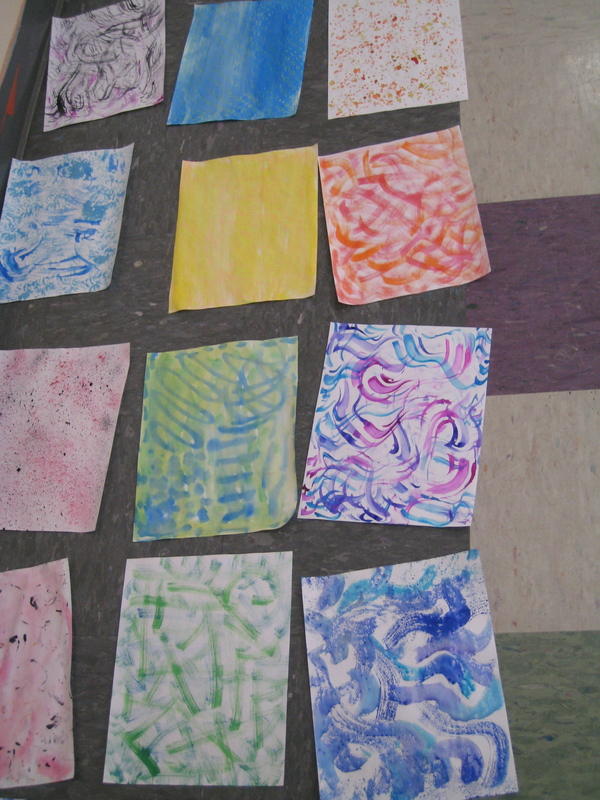 I also enjoyed using the water color and combining the different colors to make other colors. I really enjoyed looking though this website at all the visuals. When I did my water color pictures i wasn’t expecting to have such a great turn out. I enjoyed using diffrent methods such as sponge, splatter, crayon, and wet on wet. my favorite picture that i did was the sponge one. I would use something like this in my classroom, i feel like the kids would get excited and would enjoy having their art work displayed on the walls or around the school. 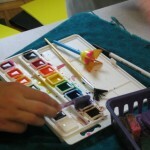 I look forward to learning more about painting and other methods to express art. I enjoyed creating textures on paper with various objects: sponge, steel wool pad, bumpy side of large water bottle, and the coils in the bendy part of a straw. It was adventurous trying to find different surfaces to work with. I initially watered down my paints too much and didn’t get much texture. Using straight paint worked better because I put the paint on the surface and rubbed the paper over it. I’ve enjoyed making books with children in my girl scout and boy scout troops, and I’m excited to learn the more creative styles introduced in class. I’m happy that some of the examples shown have been used in my children’s schoolwork! I love the comment, “I’m happy that some of the examples shown have been used in my children’s schoolwork” That means that some of our Apprentice’s, ESU graduate students or mentors have done textured papers with their students. HOORAY! These can be used to liven up so many projects. One of the important part of using WATERCOLORS is “waking” them up before painting. I use a squeeze bottle with water to wet all my paints before I begin. The water soaks into the cake of dried paint and wakes up the color before painting. Glad you enjoyed the experience. I had made some textured paper a few weeks ago, including making pink/red/purple for a lotus book with a poem in it I made for Valentine’s Day for my boyfriend. He loved it, and he was very excited about how I made it. I would really like to make some more with the crayons to make the bumps, but I am kind of unsure about what kind of crayon I should use. Would a regular white crayon work? Or do I need a plain wax crayon like in the Easter egg dying kits? I am thinking of making pocket books with my students to use in their research center. I hope to make more than one book with my students, but I still need to find out what they have art-wise for my use. Anyone at JM Hill know anything about that? My art lessons all require the students to incorperate aesthetic operations. I was wondering, could my book arts lesson be the same book art we did in class where we added one aesthetic operation for each new page in the book? I thought this would be a great pre-requisite lesson to teach the students about aesthetic operations before asking that they incorperate them into their weavings. I will have the students use recycled materials in the book art so that I can connect it to the science curriculum. Brittany – it has possibilities as a BookArt. Remember this project is about Authentic Assessment and it must incorporate visual and verbal symbol systems connected to a content area.